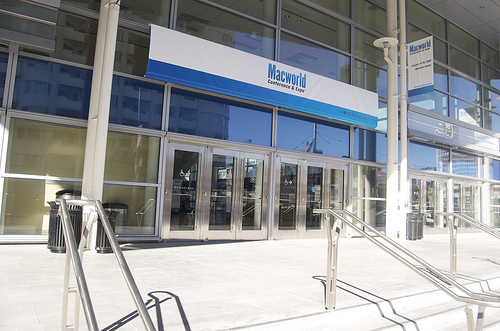 This is a continuation of Macworld Registration Part I. So if you have read Part I, I discussed experiences from my first day at Macworld fairly briefly. However, this is a side story about my registration- or lack there of. Basically, I won a Super Pass to Macworld through an online contest held by The Mac Observer. This is what allowed me to get to Macworld- I would otherwise never had the opportunity! I spoke with Dave Hamilton, President of The Mac Observer after winning the contest; he took some information and then passed me on to IDG to finish the registration. At this point, I was a bit skeptical- almost two weeks had passed with no contact. Right around Christmas, almost one month since I won the contest, I received an email from Sarah Hindmarsh, Marketing Manager of IDG. She was quite helpful and responsive to my emails, and understood my concerns. I emailed her a PDF of my registration and that was the last I heard from her. I didn’t do anything after that, in fear of being annoying. I figured I had established myself with those two people and I should be fine, whatever the outcome. When Sidney and I snuck into Moscone South on Sunday afternoon, I used one of the MacBooks to register myself. I entered my first and last name, along with my zip code (which was optional) and saw a list of three people pop up, one of them: Matthew Dodd. Delighted, I printed the badge- only to find I it was only a User Conference attendee, and my company was Axiotron. Strange, I am not an Engineer for Axiotron- although I’ll take a free Modbook! Constantly assuring myself there wouldn’t be an issue, I let it go and waited until Monday to register with everyone else. Of course, when we got there, everyone already had confirmation bar codes printed- but I still continued waiting in line. When I got to the desk, they quickly took my name and printed my badge, again with Axiotron. While I was happy to have a registration, I was annoyed that it still said Axiotron. Either way, I went to my AppleScript workshop until I became hungry- I wanted my free lunch, which came with my SuperPass! I went downstairs and spoke to someone from IDG, who was helpful and promptly got my registration changed to a SuperPass. However, they kept ignoring me, explaining that I didn’t work for Axiotron- in fact they didn’t change the company or any of my contact information. So, hungry, I proceeded to get my free lunch and forgot about it. I visited Axiotron on Tuesday, and was laughed at- apparently Matthew Dodd does work for them and was registered for Macworld. On Wednesday I went back to IDG and asked them to change my information, after explaining my story again. After going through a few people, they got me to someone who angrily asked me for my contact information and printed my correct badge! What amazes me, however is the lack of security at Macworld! I accomplished this without any photo or text identification! I was also not happy about having to do all of this after being afraid of this happening a month earlier. I also apologize for Matthew Dodd at Axiotron for spamming him when I scanned my badge- I assumed it was me. Either way, I got into the keynote first- which I will detail in tomorrows segment.